Year End Title" trophies are awarded to members in recognition of their involvement and accomplishments with their dogs throughout the year. The intent is to reward club members that participate in AKC &/or GSDCA events. 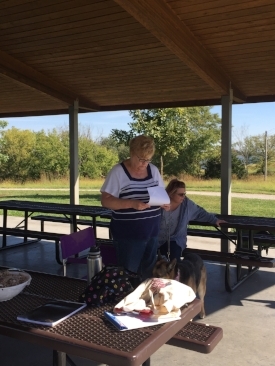 The club will award a "Year End Title" trophy to any German Shepherd Dog owned or co-owned by a member in good standing of the German Shepherd Dog Club of Greater Kansas City who earns a title or certificate in any American Kennel Club (AKC), German Shepherd Dog Club of America (GSDCA) or National accredited/licensed event. The Year End Trophies also accept all SV (Shepherd Verein) titles. The SV is the Parent Club of the GSD in Germany. The trophy year begins on December 1st and ends on November 25th of the following year. All titles earned after November 25th will be awarded the next trophy year. The deadline for submission of title documentation is November 30th of the current trophy Year. Trophies are awarded at the Awards Presentation Meeting in December. The submission form can be found on the club website (www.gsdcgkc.com) under ABOUT US/YEAR END TITLE TROPHIES. The form should be submitted no later than November 30th. Tuesday, December 12, 7:00 p.m., General Meeting and Award Ceremony, 7:00 p.m., Comfort Inn, 7300 NE Parvin Road, Kansas City, MO near Worlds of Fun. Did you know that we have a strong international presence in our membership? We currently have six members that came from a foreign country and settled in the USA. You may have heard a different accent or dialect at a club meeting or an event and wondered where is that person from and what language are they speaking. Well let me help with that! Rosi Von Fintel grew up in Switzerland. She lived 10 years in Africa and 20 years here in the USA. She has dual citizenship therefore is a SwissAmerican. 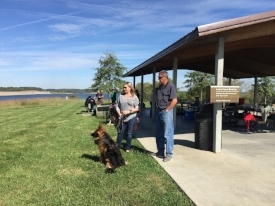 Next year the club will be publishing a special edition of the Newsletter in celebration of The German Shepherd Dog Club of Greater Kansas City 95th year anniversary. Please share any old photos, articles, or memorabilia for this publication. Contact Marion Baker (marion@gsdcgkc.com) if you would like to assist on this project commemorating the clubs 95th anniversary. Club. We are honored to have him join us. Take time to introduce yourself to Nelson. Megan Marmon and Aaron Stasiale are two of our newest members joining the club in June of this year. You may have seen this young couple at one of our meetings. Please take time to get to know them and their dogs. Megan shared what sparked her interest in the German Shepherd breed and a little about their dogs. When we moved into our first house together, I knew I wanted a German Shepherd. My dad constantly talked about the one he owned growing up, like how smart and well trained it was. I always loved training dogs, so being able to own such a smart breed was all I ever wanted. We immediately fell in love when we got our female, Aashka. She was very intelligent and never wanted to leave our sides. When in public with her people were always impressed with her training. Before long we knew we wanted to do more with her, but we weren’t sure how we could go about doing so. I decided to research local clubs, at which point we found GSDCGKC. We wanted to take small steps in both training and in working our way up to getting actual titles, so we took Aashka through dog classes in order to try for her CGC. We were happy when she passed and were very thankful that through the club, we found our trainer, Rosemarie. Eventually we moved into our second home and welcomed our second German Shepherd, Eero. While he was the polar opposite of Aashka, he was still extremely smart and willing to please. Basic obedience was a breeze for him to learn, so we wanted to begin foundation work in anything we could try. We were able to get a feel for scent work and rally, yet another thing we would have never known about had we not joined the club. Since living in our new house, we’ve been able to really understand what our dogs are capable of, and what would be best suited for them as far as training goes. Aashka was extremely helpful with our many animals, even with our young, small chickens. We planned on getting her Farm Dog Certificate, as well as utilize her to help herd our goats. On the other hand, we wanted to get Eero’s CGC and begin training in scent work, tracking, and perhaps some obedience and bite work. In the end, we would have never had any of the opportunities we’ve had if we it wasn’t for this club. With Eero and Aashka being our first purebred dogs, we had no direction with AKC events. We’re extremely thankful for everything we have learned, everyone we have met, and everything we know we’ll be able to do with our dogs in the future. You can find detailed information about the event at https://gsdca.org/national. 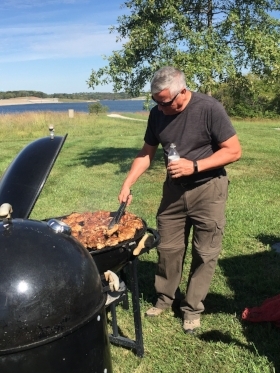 The club picnic was held on Saturday, September 30 at Smithville Lake, Clay County Parks. It was a perfect day for the end of September. 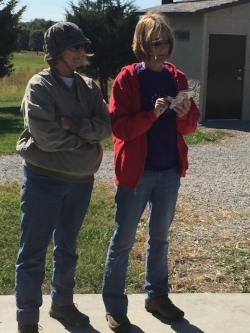 Sally Hamm and Rosi Von Fintel kicked off the picnic with some tracking fun. Rosi provided a quick lesson on laying a track and demonstrated the proper way to step in order to leave a good scent for the tracking dog. Rosi provided one-on-one training with handlers and dogs. Nancy Kennedy and Heinz gave it a try. Tina and Jeff Hess looked on with Ruger waiting their turn. Sally Hamm discussed the importance of reading a tracklayers map. She challenged members and guests to a game of reading a map and finding the “glove.” The person with the quickest time won a prize. Cindy Hartman took time out to study the map before heading out to the course. The Kutsar family joined in the fun and won the prize reporting the quickest time. Brad Baker and Ray Laughlin manned the grill and smoker. The grilled chicken was a hit!! THANKS to everyone that attended the picnic and all members and guests that helped make it an enjoyable time.